Stay informed with the 'Hamster email update! Birmingham(JM) After reports that a Pakistani national arrested while videotaping a Charlotte skyscraper also had videotapes of skyscrapers in Houston, Atlanta, Dallas, New Orleans and Austin, Birmingham Chamber of Commerce marketing committee chair Bart "Buzz" Feller was finally able to get member businesses to ante up for a much anticipated project, 'Birmingham Awareness Day'. Promotional kits showing Birmingham's nationally recognized water works and the historic skyscrapers on 'the heaviest corner' have already been sent to the Pakistani government and other states known to harbor terrorists. 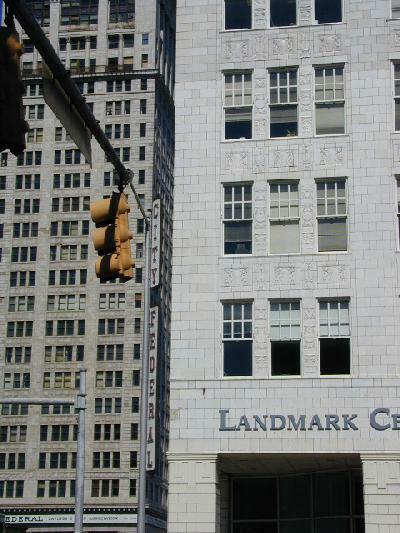 The City Federal (formerly Comer) building is featured prominently in the media packet as an important banking and financial center for the Southeast. "We want to make people more aware of Birmingham's graceful skyline," said Feller. "Especially the still-empty City Federal and Cabana Hotel buildings, which would cost as much as $20 million each to dismantle under existing hazardous material abatement guidelines, but, if destroyed by a terrorist act, God forbid, could qualify Birmingham for enormous federal emergency relief funds." "While we aren't aiming specifically to attract terrorist or illegal immigrant attention, we do want Birmingham on the world map," Feller stated. Committee member Hendricks Hollander also argued persuasively in favor of the measure, expressing concern that if terrorists don't consider the city a significant urban target in the southeast, international businesses seeking sites for American operations might also overlook it. An upcoming $17 million print, television and Voice of America radio advertising campaign will feature Courtney Cox-Arquette, Charles Barkley, and an animatronic Sun Ra doing a soft-shoe routine to Erskine Hawkins's classic, "Tuxedo Junction" and asking citizens of the world to celebrate November 8 by thinking positively about Birmingham and finding it on a map if necessary. A few chamber members privately expressed relief that Condoleeza Rice had declined an invitation to appear in the ad, but noted that Rice had agreed to send a few letters to friends on State Department letterhead affirming Birmingham's existence. Visionland(JM) When Morris Carter of Woodlawn stepped on board the Highland Avenue-bound MAX bus at the corner of 20th Street and 3rd Avenue South, he had no idea that he was in for the ride of his life. According to the calculations of the Birmingham-Jefferson County Transportation Authority (BJCTA) Carter is the 500th passenger to ride on a 'MAX' bus since service began in 1973. Greeting him on board the bus were BJCTA Executive Director, Mark Stanley, Country Commissioner Larry Langford, driver Albert Mathes III, and Mathes four children, Al (13), Caron (11), Tyndress (8), and Denise (6), who had decorated the interior of the bus with balloons and streamers in the MAX colors of blue and yellow. After a brief recognition ceremony, Carter, a 33 year old electricians helper, was given the 'seat of honor' in the back of the bus without having to pay his fare. Langford then surprised him by offering to pay for everyone aboard to spend the rest of the day at VisionLand amusement park in Bessemer. "I was overwhelmed," said Carter. "Before I said anything I looked around and those beautiful children were bouncing and clapping and I just couldnt say no. Besides, my shift was done and I didnt really have anywhere in particular to go. If I needed to be somewhere, I probably would have asked my boss or one of the other guys for a ride." When the celebration bus arrived at the park, Mathes (41) parked right in front of the entrance gate and opened the door. The merry group of bus riders had their run of the sparsely populated park and, when the day was over, Carter was given a private ride back to his Woodlawn apartment while the children slept in the comfortable upholstered seats. Clay-Chalkville() Teenage honor student Patsy Lamb was beheaded yesterday as part of the Jefferson County School System's new "zero tolerance" policy for potential teen drug use. 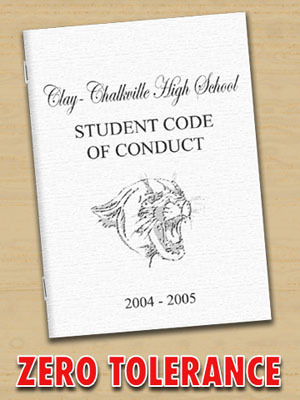 Her execution stems from an incident that occurred last fall while she was a student at Clay-Chalkville High School. After claiming that she needed to go to the bathroom, Lamb accidentally dropped a small plastic bag onto the floor. The bag was immediately recovered by her teacher, Ellen Crittenden, who then detained the child for questioning. Crittenden had long suspected the girl of potential illicit drug use due to her habitual refusal to tuck in her shirt. After a few minutes, Lamb began acting erratically, crossing her legs and clutching at her stomach. At this point her teacher franticly contacted the principal who examined the contents of the bag and determined it to contain illegal drug paraphernalia. The police were summoned and promptly arrested Lamb. The drug remains unidentified, but school officials later released a statement describing the substance as "a cardboard cylinder containing a small quantity of cotton with a string attached to the end". Local officials are baffled but believe it to be what drug users refer to as a 'bong'. Despite the fact that Lamb was an honors student with no prior criminal record, school officials remained intransigent. At her trial, an emotional plea for leniency by the child's mother was squashed by Dawna Hill, a Jefferson County parole officer and math teacher. In a highly charged video taped statement, Hill called Lamb "history's greatest monster" and swore, "Patsy's death will send a clear, unambiguous message. We will not tolerate frivolous drug use of any kind." Hill was unable to testify in person due to an accidental Prozac overdose. Although many students have fallen into a deep depression since Lamb's execution, the faculty feels certain that morale will be improved by its policy of random body cavity searches that was recently instituted as part of the war on terror. On a positive note, Crittenden has been promoted to assistant principal as a reward for her ability to apprehend would-be drug users.